For the very first time, the AA added a Foodie of the Year category to their annual Hopsitality Awards and the winner was Niamh O Shaughnessy, better known on Twitter as Gourmet Grazing. 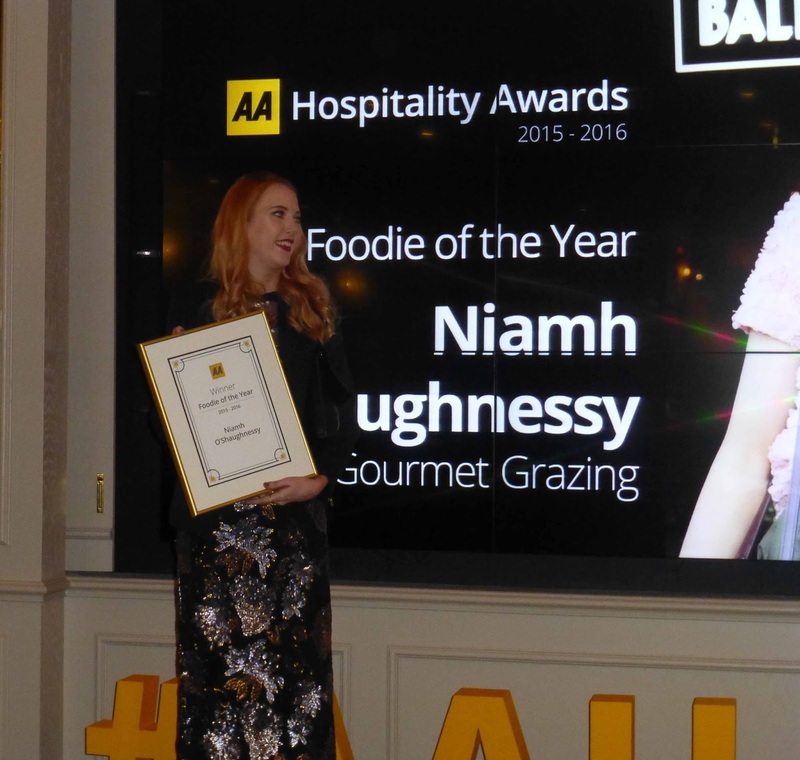 The major award of the pleasant function held last week in Dublin's Westbury Hotel saw Powerscourt Hotel Resport Spa get the AA Hotel of the Year Award, taking over from the Maryborough. AA Courtesy & Care Award: The Lodge at Castle Leslie, Glaslough, Co. Monaghan. 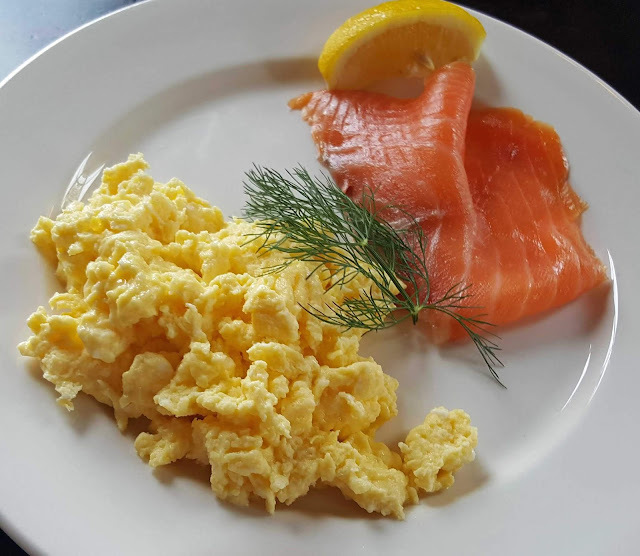 AA Guest Accomodation of the Year Award: The Red Door, Fahan, Co. Donegal. AA Delicious Dish of the Year Award: Faithlegg House Hotel, Waterford for Jenny Flynn's Scallops and Black Pudding in Cider Sauce. 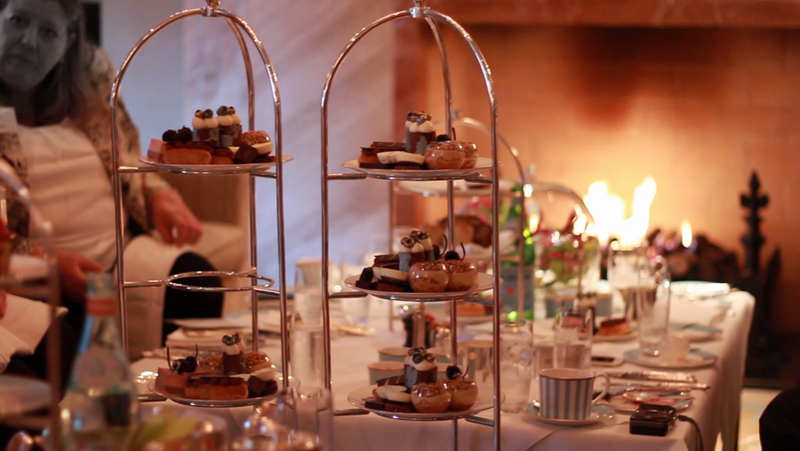 The first function of the evening for the foodies listed above and others was an introduction to the Westbury's Irish Design Afternoon Tea. 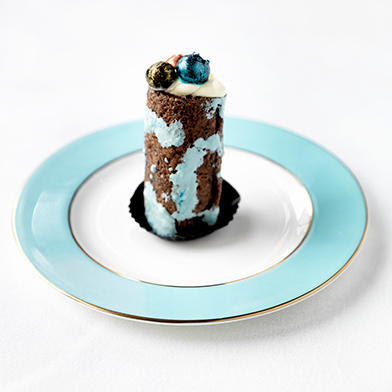 The Westbury is part of the Doyle Collection and they are partners with Irish Design 2015 and the desserts were inspired by PORTFOLIO Critical Selection 2015-16. For instance, Jack Doherty's "Duo Porcelain" was the inspiration for my favourite, the Blueberry Roulade, Chocolate, Mascarpone and Chantilly (top picture). The Sour Cream Mousse, Blackberry Cremoux (another beautiful bite) was based on Angela O'Kelly's "Sculptural Necklace". The other designers are: Cillian Ó Súilleabháin, Karl Hannon and Liam Flynn. It fell to executive pastry chef, Tatjana Upelniece-Kiselova, to bring the desserts to fruition and she succeeded with some style. 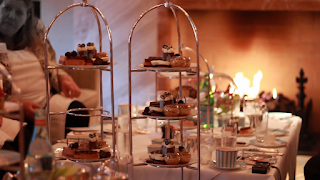 The tea includes a collection of beautifully handcrafted pastries, cakes and sandwiches and is inspired by the work of the five Irish designers, showcased through a range of ingredients and techniques. And you too can enjoy the Westbury Irish Design Afternoon Tea for €45.00, add a tenner and you can have a Champagne Afternoon Tea.